I always knew I’d be an entrepreneur, Monkey Toes jumped into my lap after taking a painting class to hang out with my girlfriends once a week. I was getting good at it and would whip through projects quicker than anyone else. While thumbing through an idea book I found a great idea for painted shoes. I tried that project and the wheels started turning – I developed my own designs, copyrighted them, found suppliers and boom Monkey Toes was born. I worked night and day as a stay-at-home mom of two girls taking every free second to get this business up and running. I can’t even count how many pairs of shoes I spent hand painting, lacing and packaging – many nights I went to bed with bloody and swollen fingers. I went through a rough time personally with a divorce, single mom-hood, layoffs from 2 consecutive jobs, and almost losing my home to foreclosure, to now – an amazing new husband, a third baby (a boy this time) and a licensing deal with a major manufacturer. My immense faith in God gave me strength and kept me pursuing my Monkey Toes dream. If given the choice I would endure it all again knowing that this journey would turn out this way – someone pinch me! I’m ecstatic with all of the evolving this little company is doing, it’s literally a 10 year dream come true. 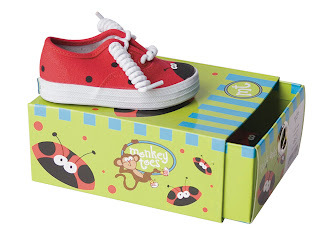 From the gorgeous and fun new gift packaging, to the revamp of the shoes (better shoes with sand box stamping soles, how cute) and don’t even get me started on the new store displays – they’re out of this world adorable! No wonder the whole package gets such a great response from everyone, but especially the kiddos. Couldn't have wished you success on a better person. Congrats, we love Monkey-Toes! Couldn't have happened to a sweeter or more deserving person! Good comes from putting out good, and you're as great as they come, Sweets...Congrats!! They are too cute! Congratulations Jenny - you deserve it. Your talent was what drew me to your shoes, your great designs kept me there (until my daughter sized out-WAAAHH), but I will continue to tell others about your great shoes and what a ROLE MODEL your business and you have been.